Muong Hich is a small village located in South West of Mai Chau district. It’s about 13km far away from the central downtown of the district. It neighbour the other 2 wards of Quan Hoa district, Thanh Hoa province, in which 96 % local people belong to White Thai race ( an ethnic minority group in Vietnam) living along the Xia stream, in primary forests and palm hill. Unlike Ban Lac – a well – know tourist destination, Mai Hich is a new tourist village, a harmony combination between human being and the natural. Whenever you come here, all your stresses, frustration or anxieties of the busy life seem to be forgotten as you become immersed in gorgeous landscapes of jungles, the peaceful beauty of the countryside culture. 07:30. Tour guide pick up guests at Hanoi Old Quarter, departure to Muong Hich, in Mai Chau, Hoa Binh. 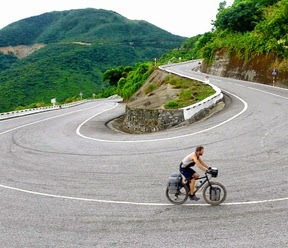 The journey take guests across the countryside landscape, countryside markets at roadsides; photo stop at Thung Khe mountain pass to enjoy spectacular scenery of the Northwestern forest. 12:00. Arriving Muong Hich and you are welcomed by local girls in traditional costumes with welcome drink and cold tower at a local homestay. You have time for relaxing before enjoying lunch with special dishes of the Northwestern forest. Taking one-hour bamboo raft trip to enjoy romantic scenery and activities of local along the stream is really a highlight of your trip which is provided by our company tourism only. Cycling to visit vegetable gardens, fish ponds, stilt houses, terraces etc. Experience the normal daily life of Thai people. 18:30. Enjoy traditional dinner. After dinner, you can enjoy traditional a performance of folk music and dance of Thai minority-group people. It wil be a chance for you to join bamboo dance with friendly locals and to drink ” Can” traditional wine. Staying overnight at local stilt houses with privacy and free wifi. 07:00. Breakfast buffet with Thai style. After the breakfast, the tour bus takes you to Mai Ha mountainous village for starting trekking tour on unspoiled village road with rice fields through bamboo forest, visit manual brick kilns, village of Thai people… Arriving Ban Lac, one often must see places on Vietnam tourism map, with strongly preserves Thai culture with old stilt-houses. Taking guide walked around Ban Lac village and Pom Coong village. 12:00. Enjoy lunch in local restaurant in Ban Lac.